Students should begin their day making a mathematical connection. This sets the tone for their day. When my students come in each morning they know the routine that is expected of them. After unpacking their backpacks and putting their folders away, they get their morning writing journals. Adding in a morning math component will only help enforce the importance of math in the classroom. I plan to add a daily math warm up that must be completed once students are done with their morning writing journal. We already do math journals in the afternoon when we come back from lunch each day, so we can use these same composition notebooks for our morning math warm ups! Sammons suggests rotating morning warm-ups but to be consistent so that students know what is expected each day. Here is how I plan to use daily warm-ups in the classroom. On Tuesday students will work on the "Number of the Day". In first grade we go from reviewing 1-20 to learning place value all the way to 120. The way activity looks will change as the year goes on... at the beginning of the year we may just be representing a number with pictures or filling in ten frames. Towards the end of the year students may be representing three digit numbers in a variety of ways! On Wednesday students will work with patterns and explaining how they finish a pattern. On Friday each student will answer a question to complete a class graph and then analyze/write about the graph in their journals. Making real-life connections to math reinforces the importance of learning math for students. These warm-ups help students connect math to life! 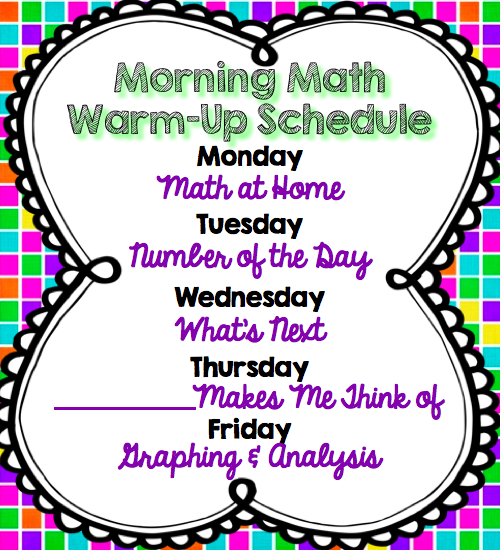 Mondays for math warm-ups I plan to use "Math at Home" where students can write about any time over the weekend that their family used math! I chose to do this Monday so that students can use anything from the weekend to make a connection! Then on Thursday I plan to use "_____ Makes Me Think Of" where students connect a current topic we are leaning about to their life! How do you plan on implementing morning math stretches in your classroom? Leave me a comment to let me know how! I just finished the chapter. I love that you are going to do Math Warm Ups. I am also planning to incorporate them. I was not too sure how to consistently do ______ makes me think of.. I am sure there are endless ways... but I am stuck... Instead I think I will do an Estimation Day there.